There is a lot of confusion over the boundary lines to the real White Oaks. Some believe White Oaks refers to all homes that are assigned to White Oaks Elementary School. Others believe that White Oaks refers to all homes south of Brittan Avenue, north of Eaton Avenue, east of Alameda de las Pulgas and west of El Camino. You could make a case for either and have a leg to stand on. In fact, many realtors, including myself, will refer to this general area as White Oaks because it is how this general area is perceived by the public. However, the real White Oaks refers to the White Oaks Development that is illustrated in the map above (a larger version can be found by clicking here). Acting as a buffer between the Howard Park and White Oaks Developments is the Oak Park Development which is outlined in yellow, above. Many people have never heard of Oak Park and are often under the assumption that they live in White Oaks proper. Oak Park was actually the original development in the flats of San Carlos. As you can see from the photo below, lots where a little cheaper than they are today. Thank you so much for the clarification on Oak Park and White Oaks. I didn’t even know about it. I have found your blog to be the most informative on the history of San Carlos. You have great knowledge about the history of the city and I really appreciate that. I like knowing about it. Thanks! 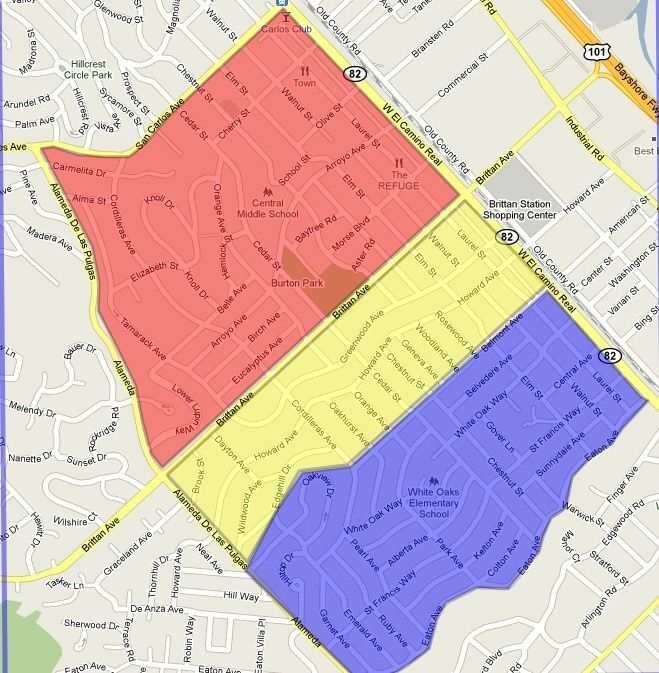 good post – good reminder than mls neighborhood identifications do not always match the original sub-division designations. i agree with Raquel, your providing insight into San Carlos history is always interesting to read. not sure if you have a prior post on this issue – but many of the streets in White Oaks were originally named differently. you can occassionally find street names stamped into sidewalks that do not match current street names. Which neighborhood has the better gas lines? I’m sure this is a bit off topic but why not asking? About 2 years ago PG&E came by our house and dug deep to inspect the gas line running in the back of our property. We never heard back, assuming all is well or is it? What is San Carlos doing about an issue that seems to gather more anxiety every day?